SDS Plus Zentro drill bit features four carbide cutting edges that make drilling into steel an easier job. 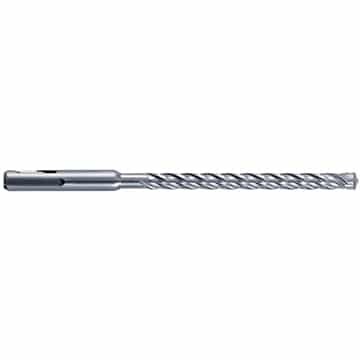 Each cutting edge is placed with 90° symmetry which prevents drill bit seizure upon contact with reinforcing steel, and ensures even flute wearing. Lateral support, a centering tip and maximal carbide to steel body interface compensate for torsional forces, allowing pinpoint accuracy. In addition, the optimized flute core strength, and patented reinforcing chamfering, ensures low vibration drilling performance and excellent fracture resistance. Penetration through steel deck plate and concrete in one easy process is achievable, and the high volume flute geometry removes drilling dust with ease. German manufacturing, quality and design.